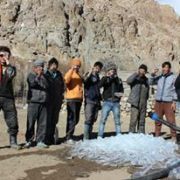 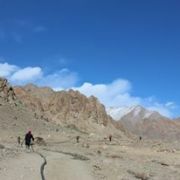 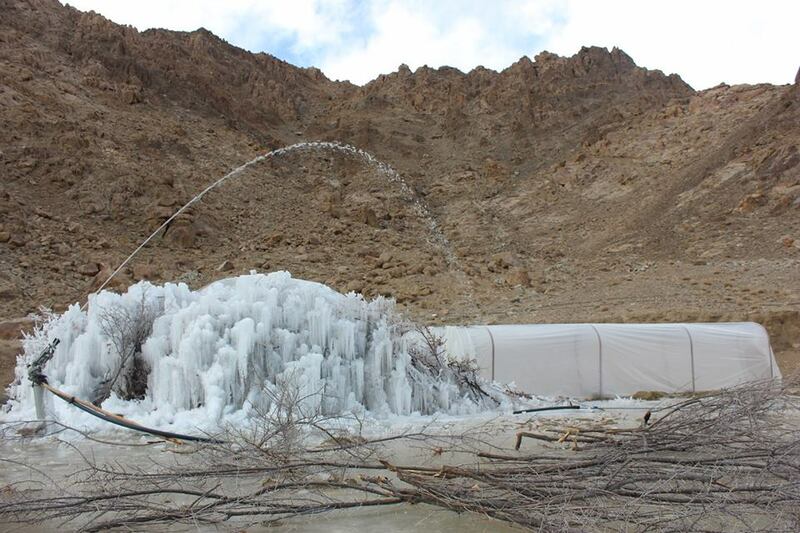 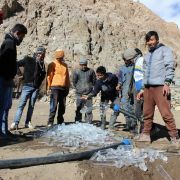 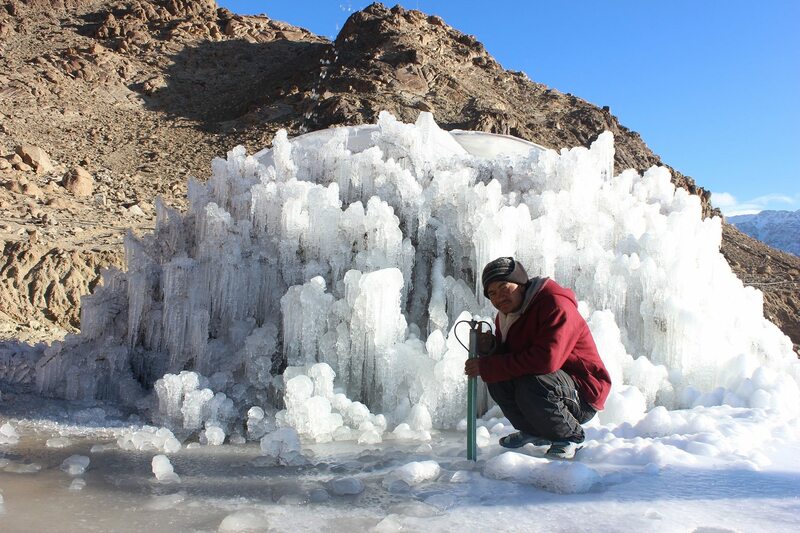 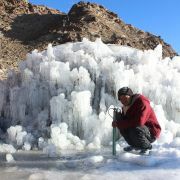 The Ice Stupa Project | Join Ladakh as it gears up to fight climate change and melting glaciers. 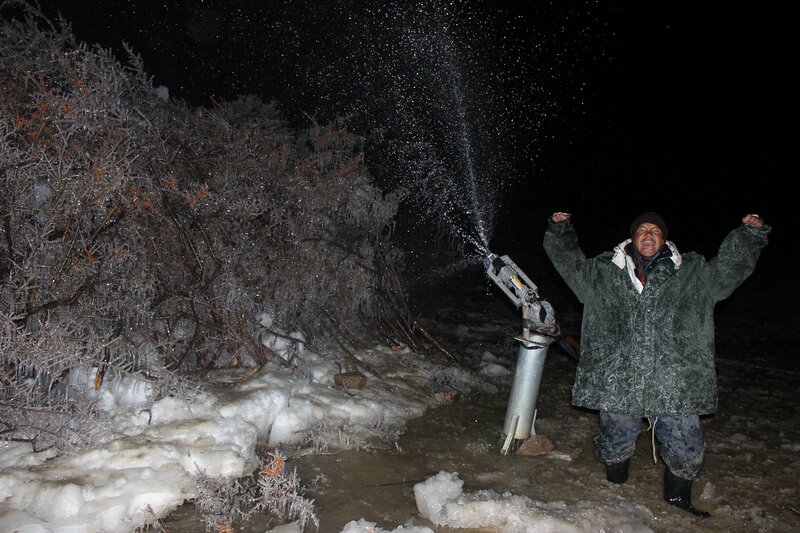 Magic by morning, makes it worth all the trouble and fun. 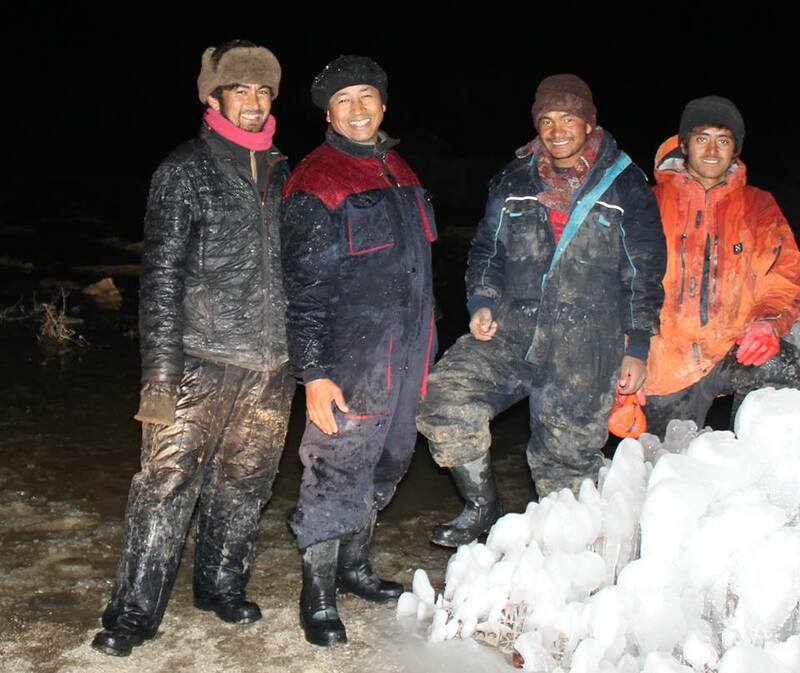 Ending the night on a good note... Thupstan Dawa, Sonam Wangchuk, Stanzin Norboo Shara and Sonam Dorjai... while Lobzang Dadul had to be behind the camera. 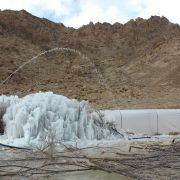 Finally stream water reaches the stupa site. 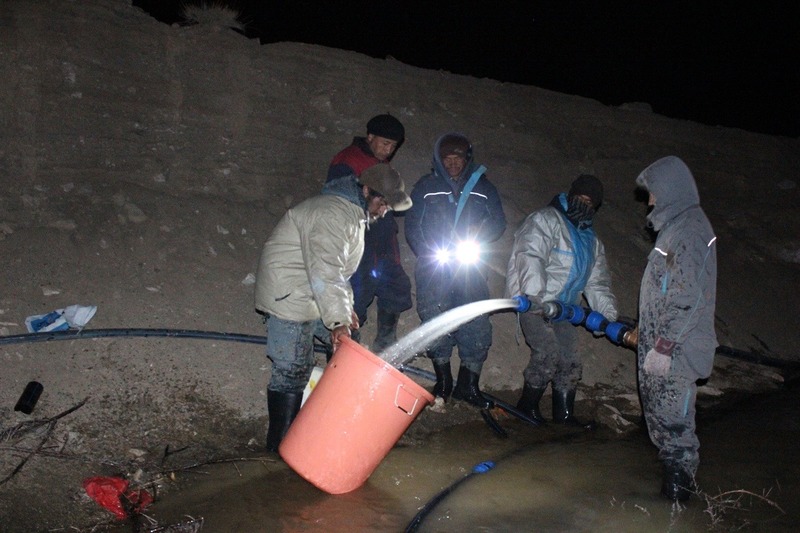 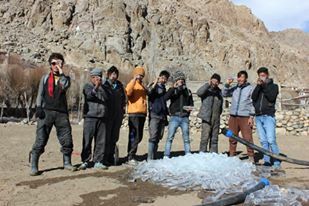 Ice Stupa team measures the discharge. 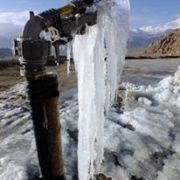 Amused to see rods of ice coming out of the now solar-warmed pipeline. 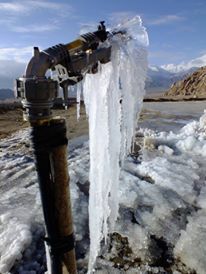 The happiness was shortlived... next day the whole pipeline froze and got blocked... to the rescue came all the students from SECMOL Campus and took out the pipes to heat in the sun. 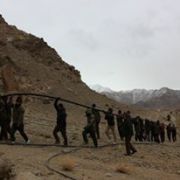 Finishing the pipe laying.... soldiers in action. 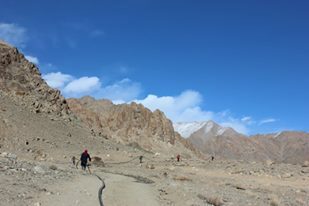 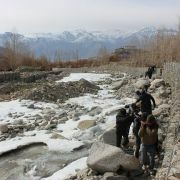 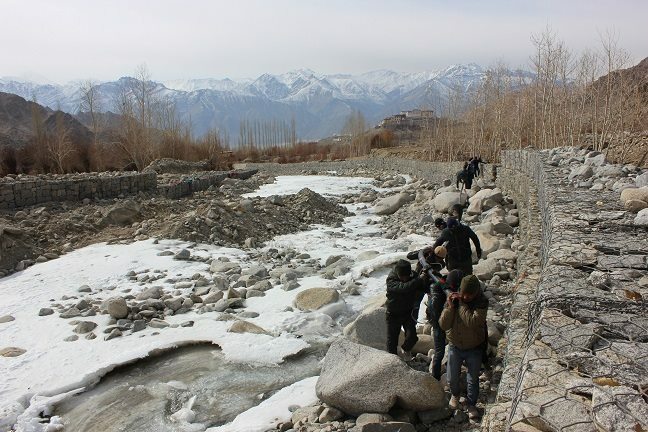 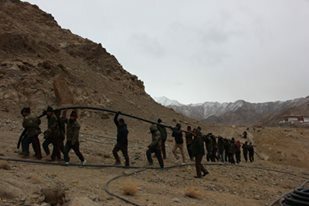 Laying the pipes at the stream headwork... Ladakh Scouts soldiers helping. 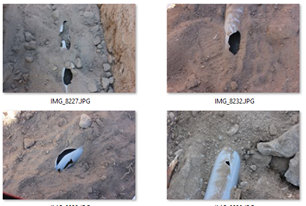 Unrolling these pipes was a tricky business. 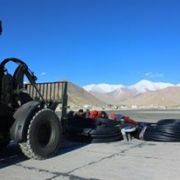 We had to device an instant unrolling machine on the spot. 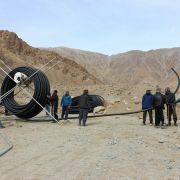 Pipe rolls arrive in Phyang village. 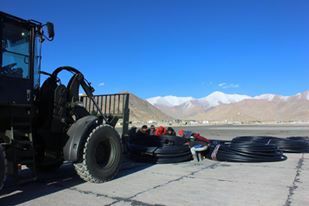 Each roll weighs roughly 450 Kgs. 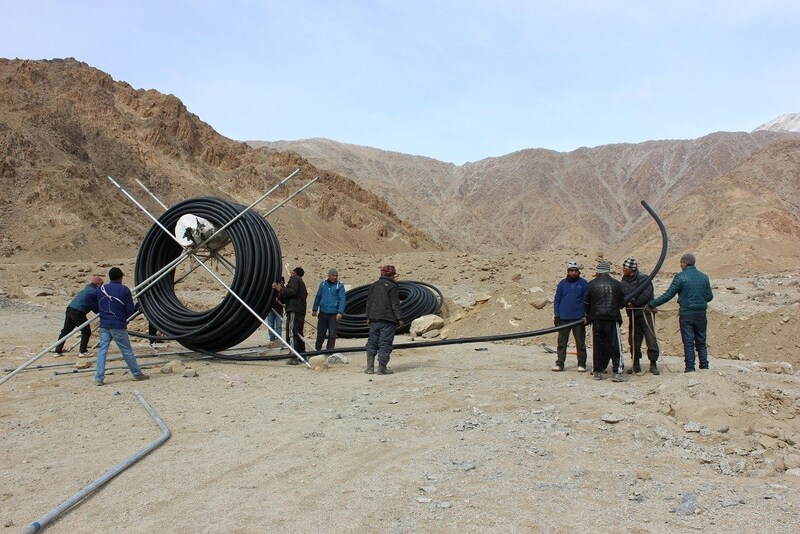 Jain Irrigation donated 2,300 m of HDPE pipe tolls weighing roughly 4,000 kilos and Indian Air Force airlifted them from Chandigarh to Leh. 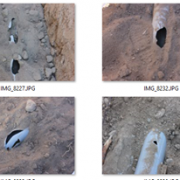 The 4" PVC pipe also kept breaking at many sites and did not instill much confidence in us... 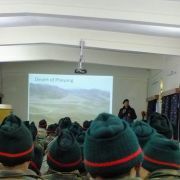 So now we have embarked upon a very ambitious Plan.... More about that later. 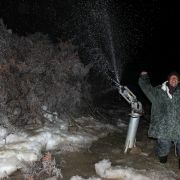 The sprinklers though modern and hitech compared to what we used in last year's prototypes .... by morning they could be appreciated only as a work of art. 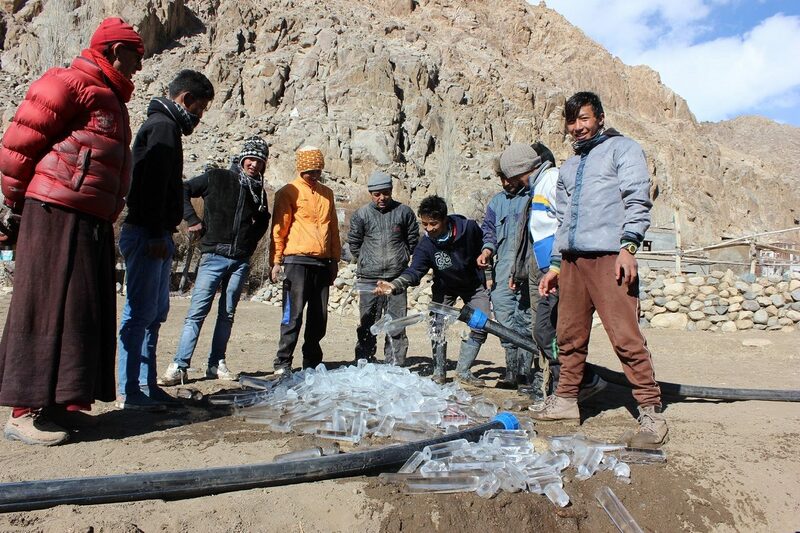 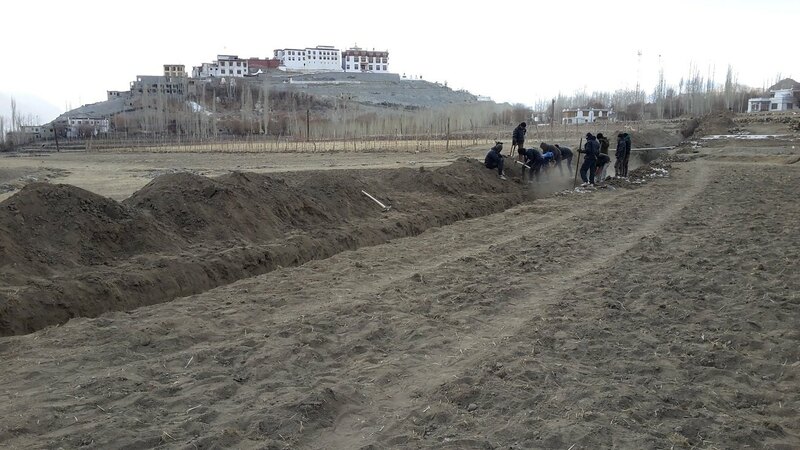 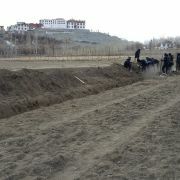 Soldiers from the Ladakh Scouts Regimental Centre volunteering with the burying of the PVC pipes. 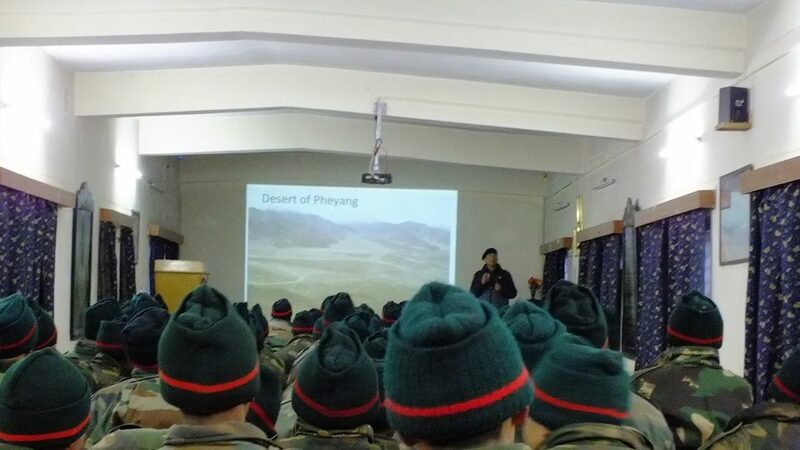 Before the soldiers came to volunteer Sonam Wangchuk visited the Regimental Centre to motivate them towards the cause. 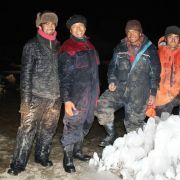 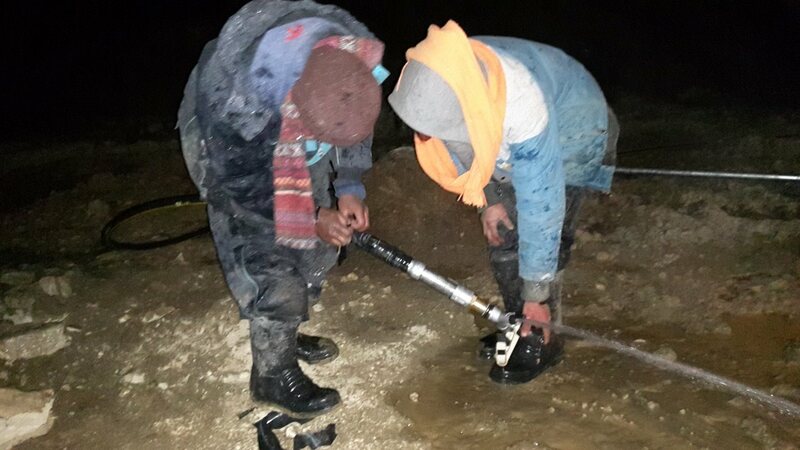 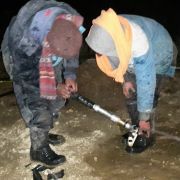 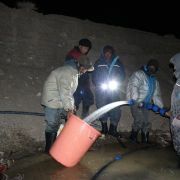 Ice Stupa team working with icy water sprinkler systems late at night.